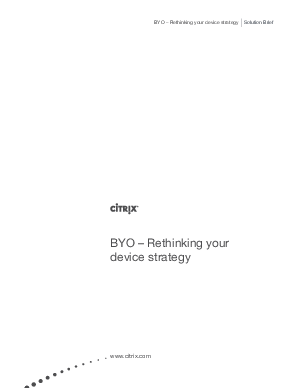 Optimize business processes, provide device flexibility, increase productivity and help IT get out of the business of managing devices by embracing “Bring Your Own Computer” (BYOC). Provide employees a stipend program and the flexibility to choose the device of their choice rather than providing corporate-mandated devices to all employees irrespective of their needs. Enhance employee productivity, liberate IT from managing devices by enabling a device self-service model through virtual desktops. Ensure corporate data security by remotely controlling sensitive data and draw a clear line between device and corporate data ownership with desktop virtualization solutions from Citrix. Citrix solution brief explains the key considerations and employee, IT and organizational benefits derived from a BYO program.